Some people have that high-tech "picture in picture" feature in their TVs. 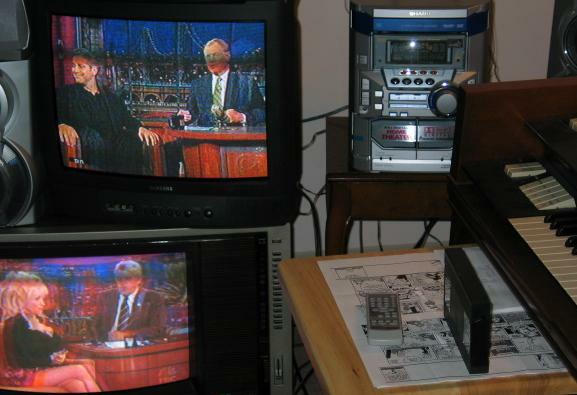 Me, I just use two TVs, one that I bought and one that Heather gave me, to watch Letterman and Leno at the same time. And for the past three months of unemployment, I have enjoyed watching the late-night shows every night. As I write this, it's 12:30 a.m. on Thursday night or Friday morning, and I'm stoked that Conan O'Brien is about to start. And I gotta say, that Stephanie Birkitt woman who regularly appears on Letterman's show -- she's his assistant but he puts her on the air for different things -- she really lights my fire. By the way, in the photo above you can see my home-theater (surround sound) stereo and my Conn Minuet organ. So much entertainment, so little interest in proper furniture to organize it all.